Folder Protector is small, efficient and extra powerful tool used to password protect files and folders. It also guards your data from being moved, rename, copy and delete. Making a folder or file inaccessible, un-deletable and unmovable is hard job but this tiny software is able to complete all these jobs. There are many encrypting utilities but they require more money as well as they will not comply with your dreams. Folder protector will use top secret methods such as Scrambling, Encryption and Locking personal data with 256-bit AES encryption technology. 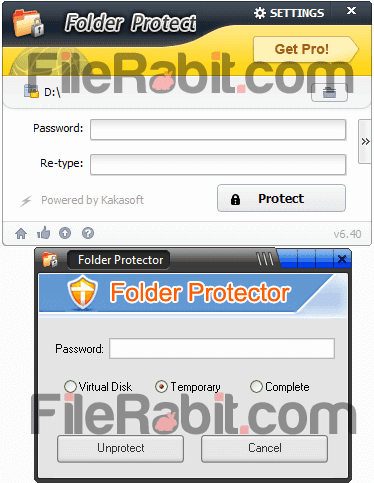 Kakasoft folder protector is portable that doesn’t need any installation or extraction to anywhere else. Just run the program directly after download, use help & guidelines if you are a beginner. However, it can password protect whole hard disk drive, mobile storage, memory cards, USB flash drives and other removable media as well. Generally, it never gives permission to unauthorized person to access encrypted data unless use of a password. So it recommends a strong password having combination of alphabets and numbering to make your data 100% protected. Lock personal office documents, family images, contacts, email / passwords, notes and whatever you want. The simple method to use, extreme technology to encrypt and no worries of deleting or moving to another location. It is enough to protect internal media as well as external removable devices. If you forget your password, recovery email or password hint. No worries because we’ve a nice trick for you to get access to protected files which were locked with it previously. Download and install ExplorerXP from here. Just put the data into specific folder, copy the lockdir.exe file into that folder, open the file and set a new password. Everything inside folder will be encrypted immediately. Getting re-access needs to open that lockdir file again, put password and click on Un-protect button.